This is a preview of the paper, limited to some initial content. Full access requires DieselNet subscription. Please log in to view the complete version of this paper. Abstract: Dynamic charging utilizes various phenomena of gas dynamics to increase charge density. Methods of dynamic charging include intake manifold resonance charging, Helmholtz resonance charging, pressure wave supercharging and pulse charging. In high speed engines, resonance in the intake manifold can be exploited to achieve a supercharging effect at high engine speeds. In lower speed engines, Helmholtz resonance can be exploited to achieve a similar effect. Pressure wave superchargers are devices that transfer energy from higher pressure exhaust gas to atmospheric pressure intake air through the use of shock waves to pressurize the intake air. Air pulse valves placed in the intake manifold duct of each cylinder are fast responding valves that are intended to create and trap pressure pulses in part of the intake manifold and the cylinder to increase charge density. The dynamics of pressure waves in the intake and exhaust manifolds at high-speed engines can be exploited to increase intake pressure without the use of a compressor   . When the suction wave reaches the plenum end of the pipe, it is reflected as a pressure wave (P > P0), which then returns to the intake valve at the speed a. If the intake valve is still open when the pressure wave arrives and closes before the wave is reflected back again, volumetric efficiency can be boosted. For this to occur, the entire wave travel, 2tw, must be shorter than the valve opening duration. Thus, at a given intake valve opening duration at a particular engine speed, the intake pipe must have a particular length to maximize volumetric efficiency. 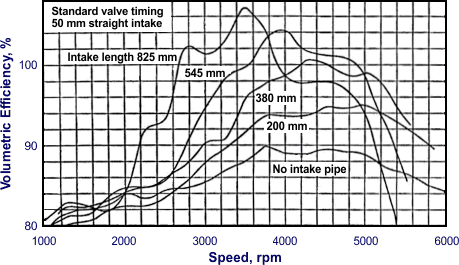 Figure 1 illustrates the effect of intake pipe length on the volumetric efficiency at different engine speeds for a naturally aspirated spark ignition racing engine  . in the RPM range < 2000 rpm where many heavy-duty diesel engines operate, the intake duct lengths shown have negligible impact on volumetric efficiency. while it may be possible to use very long intake ducts to improve volumetric efficiency even at low engine speeds, the benefits of this must be weighed against the packaging difficulties such long ducts would create and the possibility of using other technologies such as turbocharging or supercharging to improve volumetric efficiency. some benefit of intake manifold tuning may be possible in light-duty engines that operate at engine speeds above 3000 rpm provided the longer intake ducts can be accommodated. In high reving engines, if intake manifold tuning is combined with exhaust manifold tuning, air delivery ratios of up to 1.25-1.3 are possible. In some series production engines, this phenomenon is exploited with so-called variable intake systems where valves are used to open and close different length intake manifold runners at different engine speeds. Continuously adjustable length intake manifolds have also been developed that can increase volumetric efficiency over the entire full load speed range.